Colaba ([koˈlaːbaː]) is a part of the city of Mumbai, India, and also a Lok Sabha constituency. During Portuguese rule in the 16th century, the island was known as Candil. After the British took over the island in the late 17th century, it was known as Colio. The Portuguese had acquired these lands from the Sultanate of Cambay by the Treaty of Bassein (1534). The group of islands was given by Portugal to Charles II of England as a dowry when he married Catherine of Braganza. 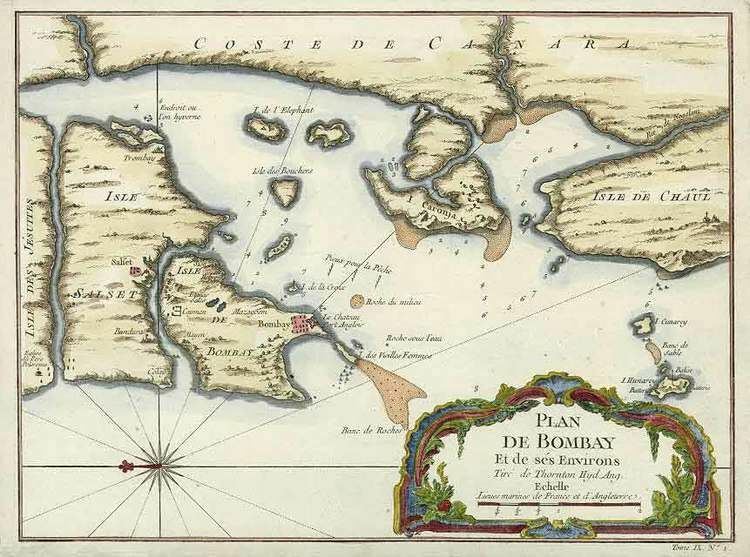 The cession of Bombay and dependencies was strongly resented by Portuguese officials in Goa and Bombay, who resisted transfer of possession for several years, while the English representatives were confined to the island of Anjediva while negotiations continued. Angered by the back-tracking, Charles II leased these lands to the British East India Company for a nominal annual rent. Gerald Aungier, second Governor of Bombay (1672), and the president of the English settlement of Surat, took possession of Colaba and Old Woman's Island on behalf of the Company in 1675. Colaba became a separate municipality ward in 1872. The Sick Bungalows (now known as INHS Ashwini) were built in the 19th century. The construction of the Anglican church of St. John the Evangelist (now known as Afghan Church after the First Afghan War of 1838) began in 1847. The Church was consecrated in 1858, with the work on the steeple being concluded in 1865. The Gateway of India, the art deco style Regal theatre, the cafes (Café Mondegar, Royal and Leopold Cafe), and the Taj Mahal Palace & Tower hotel, Bademiya Restaurant and Bagdadi restaurant, as well as a number of modern pubs, restaurants and clubs all add to the atmosphere . The southern tip is occupied by a military cantonment, including the large Navy Nagar layout built on reclaimed land known as Holiday Camp. The older parts of the cantonment retains its large, wooded spaces and is the only bit of green left in this otherwise congested area. In the midst of Navy Nagar lies the Tata Institute of Fundamental Research (TIFR), one of India's leading scientific institutions. Colaba is renowned for high-end boutiques and imitation consumer goods, and is popular with tourists. Notable residents include Ratan Tata. Colaba Causeway, or just "Causeway" as it is known in Mumbai, offers everything from bracelets to perfumes to clothes to watches, clocks, DVDs and CDs. It has an old English charm and a very modern feel as well. Colaba is also the art centre of Mumbai, with all the major galleries and museums located in and around this area.